It is the end of the month, so let's clean out my photos. In Japan, there are many different varieties of strawberries. In the past, I've shown you the Amaou, and the Hinoshizuku, now let me show you the Asuka-ruby. This strawberry was first grown in a town called Asuka in Nara prefecture. The fruit are rounder than most strawberries, so this is probably why they named them "ruby"?? These in the photo were grown by a farmer in Hyogo prefecture and cost a little more than other strawberries, but carbon footprint-wise, they were closer than fruit from other parts of Japan. Compared to Hinoshizuku, they are a bit tart, but still a delicious part of our breakfasts. Once at the market I saw this sign for "tenshin", thinking they were filled with something. I've started making coffee liqueur. Will let you know how it turns out in about 8 weeks or so. Tried this Morinaga pancake ice cream. Vanilla ice cream and some maple syrup sandwiched between two pancakes. (Morinaga makes a pancake mix which I've tried in the past. They add sugar to their mix so it is kinda sweet.) This was different from the normal ice cream sandwich but delicious. Chocopie, which I think is the equivalent to a whoopie pie, also has a dessert out which has vanilla ice cream, sponge cake and is covered in chocolate. Starbucks has started their sakura (cherry blossom) series. Sakura flavored drinks and sweets. To make the atmosphere more Springy, while I was there they even had a quartet playing classical music. They should have turned off the background music though as it was hard to hear the quartet. Cos-play, short for "costume play" is something you see all around Japan, mostly in the big cities. Most are women dressing up as their favorite anime/manga (cartoon/comic) character, rarely have I seen guys dress up, though I probably may not have been in the right places at the right times. Anyway, saw this person in Kyoto recently...always get a kick out of seeing these dress-ups. In Hawaii, this would probably be tolerated only during Halloween or maybe if there were a convention for this type of thing. I think it is so unlike the quiet, shy, demure image that I have of Japanese women. During the winter, you see these elementary boys dressed in shorts. At the beginning of February, I had a birthday and we enjoyed some Santero Pinot Rose, I loved the bubbles and loved the cork. On the top there was a smiley and on the bottom a star. For cake, we had some strawberry tarts from Mior. I also made some steak and veggies since Satoshi had to work that day. I was re-organizing my pantry and found this un-opened package of tea, which I bought several years back. It is an organic Assam tea grown in Kagoshima called Beniogata. Japan is mainly known for its green teas, so I was intrigued that this was a black tea. I was also surprised that it was still aromatic. It's been a delicious and interesting February! Saw this Mini Cooper near our shopping arcade. The guy driving was still in it with the engine running...bad for the environment. This one seemed to have been lowered because I was actually able to see the top of the car and I am short (5'1")! I was playing around with the Picnik software and came up with this shot. This cute little truck was parked at a repair shop. Since the repair shop was for Daihatsu, I think it may be the same brand. I didn't know it but most children in Japan learn how to ride a unicycle (though Satoshi says he can't). I often see them peddling around the neighborhood. On this day, I found all these unicycles parked at a nearby elementary school. We found this action figure, well half of one. Satoshi says this is "Metoron Seijin" from the Ultraman series. I think the people who upkeep this garden area must've found it and placed it onto this branch. Did you know that if a glove or keys are lost, people who find them hang them on a fence or leave them on a nearby wall? This is so that the person who lost them can pick them up when they pass by. On Valentine's Day, we went to Suigetsu Park and some of the trees had started to bloom. A week later, definitely starting to look more and more like Spring. More trees at Suigetsu Park have begun to bloom. Found this red Mini on the way back from the park. Anything exciting happening in your neighborhood? Last Sunday, Satoshi and I went to check out Hara Roll. This is the sister shop of Hara Donuts. Like their donuts, I think their cakes have okara (soy lees) and their creams have tonyu (soy milk) in them, though you can't taste either. You can purchase whole cakes but we picked up slices of 4 different types to try. Strawberry milk: a yellow sponge cake filled with cream and fresh strawberries and topped with a strawberry flavored powdered sugar. Ko-cha: Earl grey cake filled with a lightly flavored earl grey cream. Caramel: Caramel cake filled with cream and caramel coated walnuts. They were all delicious and light. Satoshi liked the strawberry milk and caramel. My favorites were the caramel & matcha. Sometimes I crave a fish sandwich for lunch...but don't want to go to "you know where" for one. Luckily for me, some of the bakeries in our area have their own fish filet sandwiches. Like the one from Ferdinand....homemade bun, some lettuce, a little tartar sauce. Their sandwich is a bit tiny, maybe 4 inches in diameter? their fish a bit on the dry side and a bit pricey at 250 yen (about US$2.50) but it does satisfy the craving. And the one from Anri...the bun is white, I think there is some rice flour in there which made the bun super chewy. The fish filet was HUGE, maybe about 5 or 6 inches long?? Hummus is really easy to make, especially if you have a food processor. I recently threw together a roasted red bell pepper hummus and we have been enjoying this as pupu (appetizer) for dinner and I also have been eating this for lunch. Roast garlic & red bell pepper in a 220C (425F) oven for 40 minutes. Take skin off of bell pepper and de-seed. Peel garlic. Whiz in food processor with chick peas. Add sesame paste, cumin, lemon juice, pulse. Drizzle in olive oil while running food processor. Whiz until you get the consistency that you like. Enjoy on pretzels or pita. NOTES: just the flavors that I remember! yummy! So, there was the Texas Burger back in January...which was good despite the limp bacon. Then in early February, the NY burger came out at McD's...meh...there was so much Dijon mustard in there that you couldn't taste much of anything else. There was also limp bacon, tomato, cheese (maybe Monterey Jack or Swiss?) & lettuce. With the tomato in there it made for messy eats. Last week, the Hawaiian burger came out...it was "supposed" be a loco moco on a bun. There was bacon (limp), lettuce, cheddar cheese, the patty, an egg (the kind in the egg mcmuffin where the yolk is not soft at all), pizza-ish steak-ish sauce (where's the brown gravy??) and a cheese bun that fell apart as soon as you bit into it. Grr...I knew we shouldn't have tried it...I always get disappointed when someone proclaims something to be "Hawaiian" and it isn't. I took a couple of bites and gave the rest to Satoshi (sorry Satoshi!)...blah! After he finished both he said something with pineapple in it would've been better...!! One more coming out at the beginning of March, the California burger...even though we've tried 3 out of 4, dunno if we will check it out. At 420 yen (about US$4.20) a pop for these burgers and 740 yen (about US$7.40) for the set, they aren't as reasonable like the rest of McD's menu and not as delicious either. It is still a bit nippy but we have been trying some beers. At first, I thought the Mexican Negra Modelo would be quite watery because it had no foamy head to it, and it looked like cola, although this one had kick, it had a bit too much bubbles for me...5.3% alcohol. Brooklyn Lager is a bit fruity but really full bodied. I liked this one...5.2% alcohol. Royce, a famous Japan sweets maker in Hokkaido, teamed up with Sapporo Beer and produced this Chocolat Brewery...5% alcohol. I think this beer actually came out last year but it was only offered online at the time. I found this one at Carrefour awhile back and bought one for us to try...the aroma turned me off, fake chocolate aroma, like some of those scratch and sniff stickers...it was a good beer, but because the aroma turned us off, we decided it wasn't worth buying again. 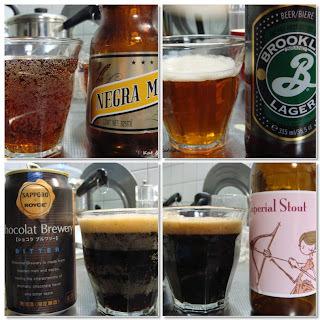 On Valentine's Day, we tried the Imperial Stout by Minoh Brewery....8.5% alcohol. I liked this, it was full bodied with some bite to it, smokey and hints of chocolate. I loved the label too. I guess I'm a little biased because this brewery is in our neighborhood. Did you know that this brewery is run by three sisters and they make, bottle and label each beer by hand. I hope they never change what they are doing. Have you tried any interesting beers lately? There is a food court of sorts inside the Yodobashi Camera building in Umeda and is called Sweets Museum. At first when this area opened, there were all sorts of sweet shops but as businesses folded, they have started bringing in many savory shops. Recently, when I passed by, I noticed this shop with a vertical rotisserie and it smelled wonderful! I made a mental note and finally got a chance to try it. This shop specializes in Turkish doner kebabs, which I found out is the vertical rotisserie. Satoshi chose the beef with curry and I chose the chicken with cheese. Each kebab was topped with shredded cabbage and some red onion. My kebab wrap was also topped with a yogurt sauce. I loved how the edges were cripy and the bulk of the wrap was chewy. The chicken was a little dry, but the taste overall was delicious. Satoshi enjoyed his kebab also. Total with soft drinks, 1500 yen (about US$15). I love how you can always find someone sleeping in remote areas of buildings. This guy was snoozing away near the restrooms. One of the features on my iPhone is a program made by Nike. It uses a sensor, which you have to buy separately, you calibrate it according to your walking or running pace. The sensor fits at the bottom of several Nike shoes, but you don't have to go out and buy their shoes (though that IS what they would hope). I have a little rubber pouch that this sensor fits in and it attaches to the laces of my shoes. The instructions on their website states that only if you will be going for a workout, should you use it. Meaning, if you are just going to the mall, where your walking may be stop and go (I think it only records after you go a certain speed, otherwise it doesn't detect movement and goes to sleep), then it wouldn't be favorable to use the sensor, plus you'll wear out the battery faster. After you walk/run, you send your data to Nike through iTunes, and it tracks your progress. You can set goals, like you will run 10 miles by a certain date. Or like me, my recent goal is that I will burn 2000 calories within 2 weeks. Anyway, the good thing about this sensor is that it sends the mileage info to your iPhone or iPod and calculates how many miles you walk/run, plus calculates how many calories you have burned. You can set different types of workouts: by time, by distance, or by calories. The bad thing about this sensor is that you never know if it is off or on. The battery is supposed to last 3 years but it would depend on how often or how long you use it per walk/run. And, it isn't eco-friendly, you need to buy a new sensor when the battery goes kaput. Still, I've used this for about a month now. I used to think that my regular walks to the grocery store in the mornings were enough, but they weren't. I am pretty proud of myself because it has gotten me out of the house even during these cold months. So on top of my walks to the grocery store, in the afternoons, I walk for about 30 minutes to an hour about 4 or 5 times a week. Hopefully, by the time my sensor's battery goes kaput, I will have lost a little weight and Nike will have come up with a way to change the battery. According to Rowena of Rubbah Slippahs in Italy, she has no faith in the Italian postal service. If you read her blog (and you should), you'll know why. Good postal service is something I take for granted here as the Japanese postal service and home delivery service (similar to UPS/DHL) is pretty high quality, I feel. For example, if you aren't at home when they deliver something, they will leave you a slip to have it re-delivered and you can specify a date and time that you want them to deliver, like in the morning between 9:00-12:00 or in the afternoon 13:00-15:00 on the 5th. And if you catch them early enough, they will re-deliver that same day. Anyway, Rowena was super kind in sending us these goodies. The package was opened on arrival in Japan by customs, but it looked like everything was intact. I love the friendships made from blogging and though we have never met face to face, Rowena, I know we will one day! Satoshi and I really appreciate your kindness and can't wait to try all these goodies! Awhile back, one of my readers, Rona, suggested Ola Tacos to me. It is a tiny bar with several tables and a counter near Shinsaibashi. After we were seated we waited several minutes, and were able to order drinks and then it took some more time before our food came. While we were waiting for our food, we intricately checked out their book shelf next to our table. The first dish to come out was camarones al mojo de ajo, garlic seasoned shrimps still in their shell. I really wanted to try the al pastor tacos since I've seen them on many blogs, but they were out. I think they make their own tortillas, they were about 4 or 6 inches in diameter. Kind of tiny by US standards, but actually just right to try. I thought the lengua was on the mushy side. We both liked the chorizo taco. We also loved the fresh salsa. We had to wait a long time for the nachos...950 yen (about US$9.50), these were delicious, the chips were still crispy and we drizzled some of their hot sauce on it. Since Satoshi was still hungry, we also ordered some totopos, chips with guacamole....550 yen (about US$5.50). Satoshi had 2 beers and a frozen mango margarita and I had 2 frozen lime margaritas. Except for the really SLOW service, we liked the food. They knew they were really slow and gave us a little discount...total 6350 yen (about US$63.50). Recently, Tamakikat posted about Hara Donuts. These donuts started from a shop in Kobe that makes tofu (soy bean curd). After looking at the address for the tofu shop, I figured out that it is located near my host family's home. I really wanted to try their ko-cha (earl grey) donut, but they didn't have this flavor on this day, so I chose 4 different ones for Satoshi and I to try. Hara Donut--the original, made from tonyu(soy milk) and okara(soy lees). Tamba Kuromame Kinako--Tamba is an area in Kyoto that is famous for their black beans. This donut is sprinkled with roasted kuromame (black bean) and kinako (soy bean powder), this one had a nice nuttiness flavor to it. Satsumaimo--sweet potato, there were crunchy bits of sweet potato in the donut. I liked them all since they were not heavy like cake donuts. They reminded me of those soy milk donuts in Kyoto's Nishiki market. 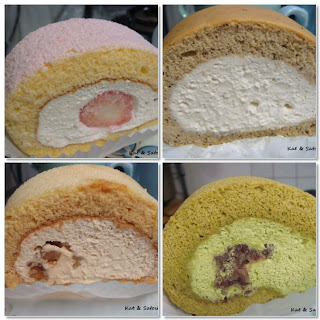 I want to try their rolled cake at their sister store, Hara Roll, but that will have to wait for another time. Honmei means "real feelings" and giri means "duty or obligation". During Valentine's here they have two types of chocolate giving, honmei & giri. I've written about this in the past here. This is what I gave Satoshi, these "merci" (thank you) chocolates (honmei, of course!). He likes milk so that is what I gave him. He was so happy, he ate them all in one day. There were these cute chocolate tea cups in the set, the semi-sweet chocolate cups were flavored with earl grey and the milk chocolate cups were a milk tea flavor. On the bottom of the "tea cups" they actually had "Afternoon Tea" written on them, just like real china. Satoshi shared with me the darker chocolates, like this one filled with caramel. I guess I'll have to wait until White Day (March 14) for my Valentine's gift. I hope you had a nice Valentine's Day!